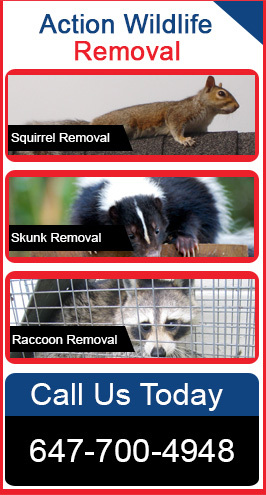 At Action Wildlife Removal, we offer safe, humane and professional opossum removal and exclusion. If you have an opossum or a family of opossums living under your deck or shed, we can provide effective solutions to remove them from your premises and keep them out for the future. Opossums are omnivores and can feed on almost everything. Opossums can easily gain access to your home through any hole or construction gap where they will urinate, defecate, chew electrical wires and cause significant damage to your property. Our experts will repair the holes to keep opossums out along with complete attic restoration service and property clean up. Our expertise and experience allows us to use the most advanced techniques to prevent these invaders safely from your place. Opossums look like large rats having pointed snouts and hairless tails. An adult opossum weight between 10 to 14 lbs. They can live up to 4 years and usually mate in January. They are nocturnal and are always in search of food and shelter. They have a total of 50 teeth and are strong enough to tear holes right into exterior walls. Opossums are opportunistic feeders and most often rummage around at night for food. They prefer meat, rotting carcasses, but they can eat almost everything. In stressfully dire situations, they will “play possum” – they will fall over and pretend to be unconscious and will excrete a smell similar to a rotting carcass. Since opossums prefer to live in and around residential and commercial properties, they often come in contact with people. They can bite the pets and spread fleas and other parasites. They live in human structures such as attics and sheds where they defecate and urinate and also damage the property. Opossums carry a large amount of parasites, including fleas, ticks, etc. They also pose serious threats to humans and can cause various health ailments such as leptospirosis or Salmonella. Opossums generally don’t respond to repellents, music, moth balls or ammonia. You need to trap and relocate them before they cause significant damage to your property. Our experts at Action Wildlife Removal will identify their potential entry points and seal them to reduce their chances of re-entry. They will safely trap and relocate them miles away from your premises. Once the opossum is removed, they will also sanitize the entire area to prevent infections. Call our experts today to know more about our Opossum Removal & Control Services.